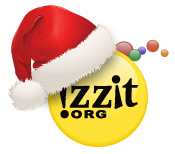 izzit.org News: Merry Christmas from izzit.org! Due to the holiday our office will be closed December 24th and 25th, as well as January 1st. Customer service will be available December 26, 27, 28, and 31 from 8am to 6pm EST. January 2nd will resume our normal days and hours.